There are many nooks and crannies of London that cannot be seen and/or appreciated at any other speed or by a different method of transport, Boris bike and Google Street map included. 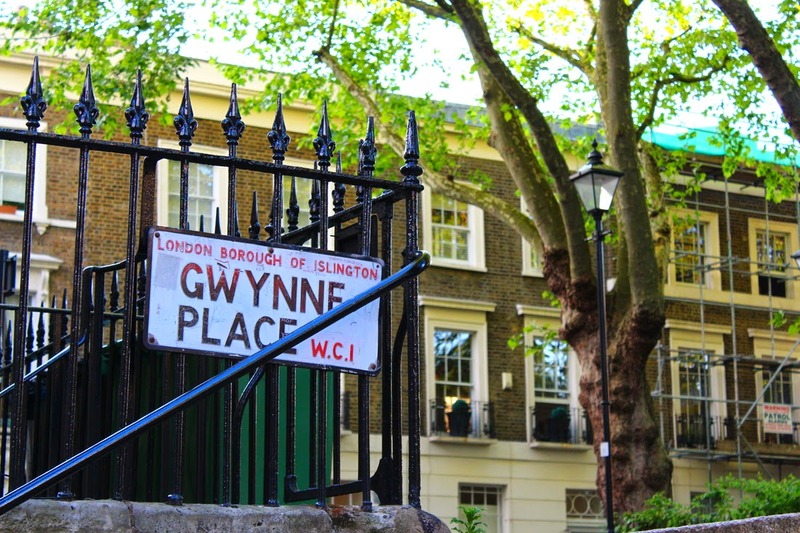 One example of this would be Gwynne Place in Clerkenwell. The novel Riceyman Steps was written by Staffordshire author Arnold Bennett and published in 1923. This is a richly layered novel set in Clerkenwell, London. The famed Riceyman steps "lead from King's Cross Road up to Riceyman Square". In real life these steps are of Gwynne Place and Riceyman Square is Granville Square. The vividly realised central characters in the novel are; second-hand bookshop proprietor, Henry Earlforward, neighbouring shop owner Violet Arb and their shared servant, the young and widowed Elsie. Earlforward inherited the bookshop from his uncle, who died shortly after giving Henry an excitable account of Clerkenwell's history. Is this a foreshadowing? They key episode of the area’s history is the arrival of the first underground railway in the world. At first, the railway was greatly desired, bringing with it the anticipation of increased commerce and prosperity. Hopes are shattered as perilous construction work shook foundations and endangered lives and so became feared and loathed. "All Clerkenwell was mad for the line. But when the construction began all Clerkenwell trembled. The earth opened in the most unexpected and undesirable places." If you venture into the square you will see on both the north and south sides of Granville Square that there are evident seems within the brickwork. This is evidence of the houses on the West side of the square once having been removed. This was done in anticipation of the railway. When the space was not required a new terrace was built. Arnold Bennett suggests that something as powerful and deep as the railway will shake his own characters' lives. The evocation of Clerkenwell, its architecture, history, and indeed the shop itself, induce feelings of claustrophobia. Miser Henry is as securely locked into his world as his coins and notes are locked away in his safe. Deeply attracted to one another, Henry and Violet marry. The couple spend their 'honeymoon' visiting Madam Tussaud's and it’s Chamber of Horrors. Did they perhaps shiver together when confronted with the wax work of Dr Crippen? They economise on the return tram fare. Is this the second foreshadowing? Henry's truly 'grand passion,' his miserliness, slowly increases in its presence. When tragedy strikes it’s not due of the dodgy electricity supply but something much more sinister; deeper. It arises from his inability and unwillingness to be anything but rationally devoted to his love of the green stuff. The once bright and cheerful Violet is caught in the web of his obstinacy. After only a year Violet fades and tragedy looms, both as stark reality and metaphor. Their 24yr old servant Elsie lives in Riceyman Square. She had surprised her employers on their marriage by throwing rice, tying a shoe to the bed and providing a cake. Elsie yearns for the return of her shell-shocked lover, Joe. Only when the Clerkenwell newspaper vendors trumpet "Love and Death" will Elsie and Joe's story resume. Bennett touches the nerve ends with this brilliant novel. Whizzing down the top of Baker Street you may fail also to notice two brown plaques on Chiltern Court. One reads: “The Arnold Bennett Society Arnold Bennett, author 1867 – 1931 lived, worked and died here, 1930-1931. The second brown plaque reads: The H.G. Wells Society H.G. Wells, author, 1866 - 1946, lived and worked here, 1930 - 1936. And so it appears that Arnold Bennett and H.G. Wells were neighbours within Chiltern Court, Baker Street. Now, how do you put those bits together when zooming around and not exploring on foot?